Nice Fish: A Brilliant Catch At A.R.T. Snow-swept vistas often have unreal, even surreal feelings. 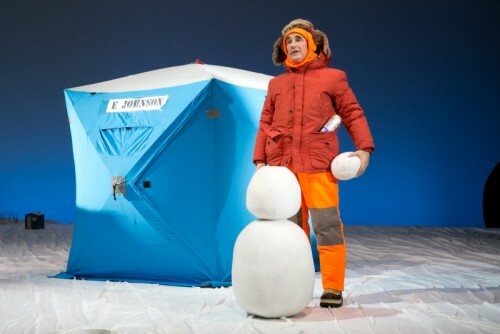 This is enriched by the wonderful words, acting and stagecraft of Nice Fish by Mark Rylance and Louis Jenkins now at the American Repertory Theatre (A.R.T.) in Cambridge. Set on a frozen Minnesota lake on the last calendar day of ice fishing season, Nice Fish is a prose poetic, laugh aloud and visually inventive story of two ice fisherman, the unlikely characters they meet, and the absurd and the beautiful in life's big philosophical issues. 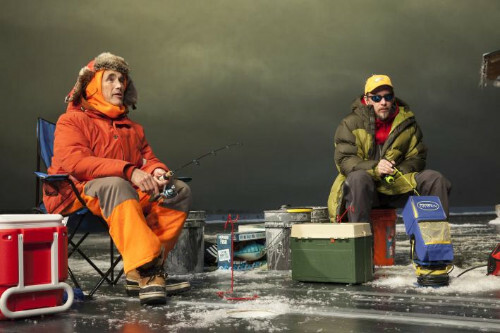 Created by two-time Tony Award/Olivier Award-winning actor Mark Rylance in collaboration with Duluth poet/actor Louis Jenkins, Nice Fish centers on two men who have gone ice fishing. With the ice beginning to melt literally as well as metaphorically and the Department of Natural Resource ranger watching, the two protagonists take turns hypothesizing and recollecting. Interjecting at times both profound and seemingly superficial thoughts while the last blizzard of the year is about to blow, the two dance in an elaborate verbal and gestural foxtrot at times disconnected and connected at the same time. Occasionally other characters step in and out. Through often very surreal dialogue, monologues and observations, characters travel from points A to Z and slightly beyond. Through blackouts, pratfalls and often penetrating discourse, the production vignettes form a collage of amusing insights and sometimes poignant remembrances that often are unexpected and Just as often poignantly charged. Presented through cadence, nuance, and passion of the actors presenting them, each piece works together to evoke a quite unique theatrical experience. Nice Fish is a less minimalist Waiting for Godot of ice fishing. Here absurdist memories and moments of reflection about the nonsense and perceptions of life’s realities are underscored by juxtaposing physical comedy with weighty sadness, and punctuated by startling amusement. Howling like a spring snowstorm and like Godot, Nice Fish is at once inexplicable and somehow beautiful. Here, natural surroundings are no more dangerous than our human foibles, aspirations and vulnerable ageing. We are entertained by the very humanity of the play. 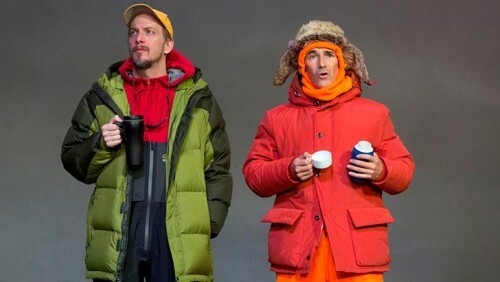 Wonderfully characterized by Mark Rylance and Jim Lichtscheidl as ice fishermen Ron and Erik, initially it seems that the alternating speeches seemed meandering and even peripheral, but this is not the case. Their dueling discourse is actually about life's Big Questions: Why are we here? What do we value and why? What is our own value? 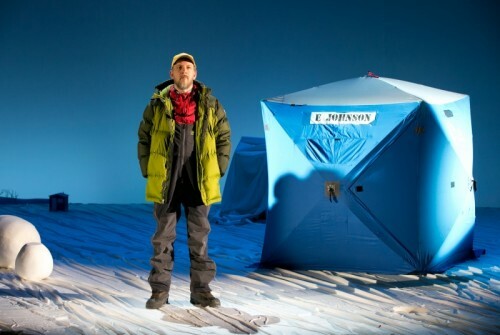 The play is brilliantly constructed around poems by Duluth-based Louis Jenkins. Many of his over 400 prose poetry pieces have been used over the year’s on A Prairie Home Companion. His take on things profound and profane exposes a philosophy that finds humor in bizarre juxtapositions of everyday imagery. Classically trained Rylance pauses at just the right dramatic and comedic moments. His delivery timing is perfect. Lichtscheidl’s Jim plays the perfect rather serious foil for Rylance’s more clownish Ron’s expressions mirrored in both characters’ most mundane, passing comments. 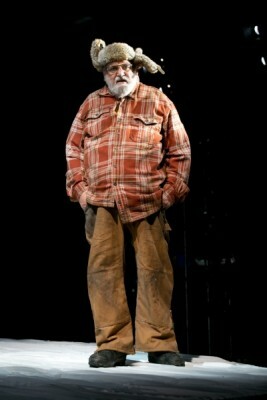 Apparently Rylance and Director Claire van Kampen harvested the poetry in collaboration with Jenkins, who also acts in the play somewhat sardonically as well as Wayne Johnson. Kayli Carter as Flo and Bob Davis as the DNR man balance out the cast. Playing a dreamlike role (Flo) and a nightmarish rules and regulations hypernaturalism (DNR ranger), these two distinctively different characterizations add to the surrealism of the action. The stagecraft is superb. Counter to a minimalist Godot setting, there are plenty of clever props and scenery changes in Nice Fish. Kudos to the set designer Mark Rosenthal and lighting designer Japhy Weideman. Director Claire van Kampen’s staging is also vibrantly brilliant. Not enough can be said about the quality of Mark Rylance’s performance. His deft handling of the comedic fool is Shakespearean in its depth and insight. Previously he served as the first artistic director for the rebuilt Shakespearean Globe Theatre in London. Rylance has been more recently nominated for best supporting roles in both 2015 Emmys (Wolf Hall) and 2016 Oscars as Rudolph Abel in Bridge of Spies. He is considered by many to be the best actor of his generation. First performed at Minneapolis’ Guthrie Theater in 2013 and on its way to New York at Brooklyn’s St. Ann’s Warehouse, Nice Fish is a great catch for the A.R.T. Funny, clever, imaginative and thoughtful, it's also damn entertaining. Destined to be a contemporary theatrical classic, it is a show to cherish.